The Spokane VA Medical Center has Community Based Outpatient Clinics (CBOC's) and five Rural Health Contract Clinics. These sites have designated women's health care providers that are interested and proficient in providing women Veterans with the very best comprehensive health care. Military Service history and VA benefit utilization statistics prepared by the National Center for veterans Analysis and Statistics. 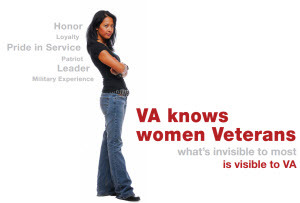 Did you know that women are the fastest growing group within the Veteran population? Learn more about the The changing face of Women Veterans and what the VA is doing to meet their health care needs.